The National Theater of Bahrain project was the subject of an international tender won by the French architects AS.ARCHITECTURE-STUDIO, a practice that already has several references to its credit in the Gulf region. Officially unveiled on 12 November 2012 during the festivities being held in Manama – the Capital of Arab Culture 2012 – this venture is among the Kingdom’s largest undertakings. As the first national theater of this scale in Bahrain, the venue provides a new stage for the eighth annual Spring of Culture, as well as the election of Manama as the 2013 Capital of Arab Tourism. Bahrain means ‘two seas’ in Arabic: this maritime reference captures the insular character of this Arab-Persian Gulf archipelago together with its extreme horizontality which fostered the building’s design. In fact, AS.ARCHITECTURE-STUDIO chose to situate this 12,000m² theater facing the artificial lagoon of the National Museum, so as to preserve its views and, more importantly, its majestic profile towards the sea. Its openwork structure creates a harmonious exchange with the nearby National Museum, built in the 1980s, with which it shares public spaces that serve as foundations for this ceaselessly evolving cultural district. “A building is only meaningful if its personality and relevance combine on a given site,” explain Roueïda Ayache and René-Henri Arnaud, founding associates of the AS agency. 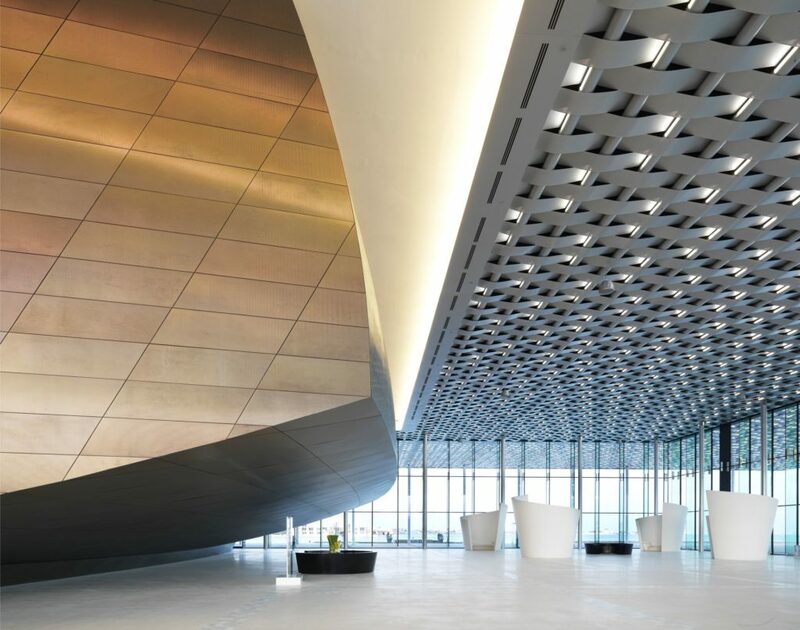 Set between land and sea, the first distinguishing feature of the National Theater of Bahrain is its roof canopy, a weave of openwork aluminum that is of major importance, to filter sunlight and, above all, keep the high temperatures in check. Inspired by the country’s traditional wicker rooftops, this immense sunshade also provides natural ventilation for the extensive outdoor walkway, another of the Theater’s attractive features. AS.ARCHITECTURE-STUDIO’s contemporary design blends perfectly with its surroundings. Below this canopy lies an inner shell clad in gold tinted stainless steel, which houses the 1,001-seat auditorium with a foyer enabling spectators to move from one balcony to another. This enclosed shimmering gold jewel-case contrasts with the transparency of the main hall bathed in sunlight and stands as the building’s true cornerstone: this is literally and metaphorically where it all happens. The main auditorium is 129.6 m long by 75.6 m large with a ceiling height of 12m. 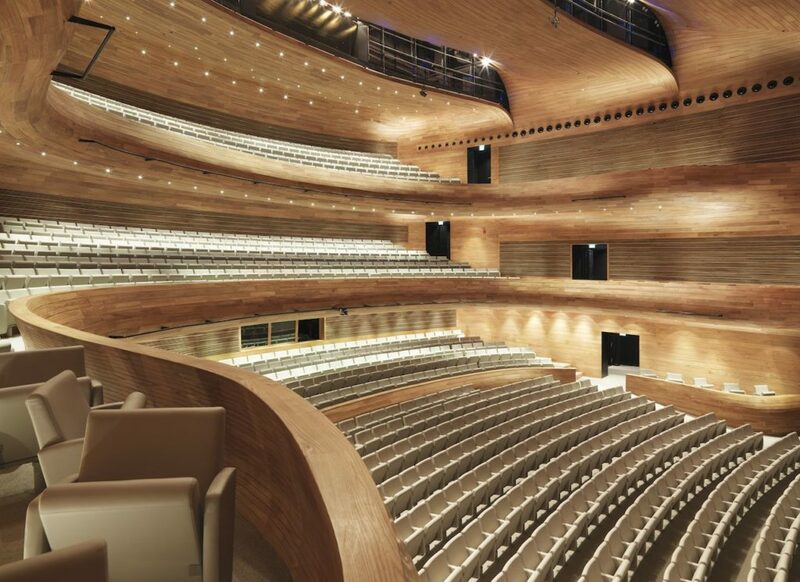 All the wall and ceiling surfaces of the auditorium (1656 m²) of the auditorium are entirely clad in wood paneling, which is made up of 30mm composite MDF panels finished with a 6mm natural veneer facing of American red elm. 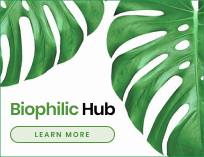 “We chose this species for its superior acoustic qualities,” explain the architects. The result is quite stunning: firstly because one rarely sees projects where American red elm has been specified on this scale. Furthermore the wood paneling has been beautifully crafted to look like the inverted hull of a ship, reminiscent of the architecture of dhows, the ancestral fishing boats used on the Bahrain pearling trail, a very ancient local tradition. The natural grain patterns, which are very visible in American red elm, enhance the flowing almost organic shapes of the balconies. The balcony railing tops are in solid red elm and above the first balcony railing the wall cladding is in solid red elm slats with motorized acoustic curtains behind. Likewise cladding in solid red elm slats have been specified at the back of the auditorium and in the main lobby but here the acoustic insulation is fixed. The curved soffits of the balconies and main ceiling are also formed out of MDF in layers on steel and timber frame and finished with elm veneer. The average dimensions of the MDF panels with red elm veneer facing are around 190 x 2800 mm. All the panels were treated with a fire retardant before assembly and are mounted on steel and timber frames. The bespoke joiners used the architects’ CAD drawings to assemble the paneling. The acoustic performance of the paneling was also tested on a scale model prior to assembly. Only the straight sections were prefabricated and the supporting main steel ribs were also cut to the required shapes at the production plant. However all the curved paneling was shaped and assembled on site and the brass strips to enhance the flowing lines of the interior design were also inserted on site in the wood panelling. Thanks to a range of sophisticated stage equipment (invisible sound absorbing curtains, removable acoustic shells, padded leather chairs by Poltrona Frau) the auditorium can be easily reconfigured to cater for different forms of live entertainment while retaining the same visual and acoustic quality. 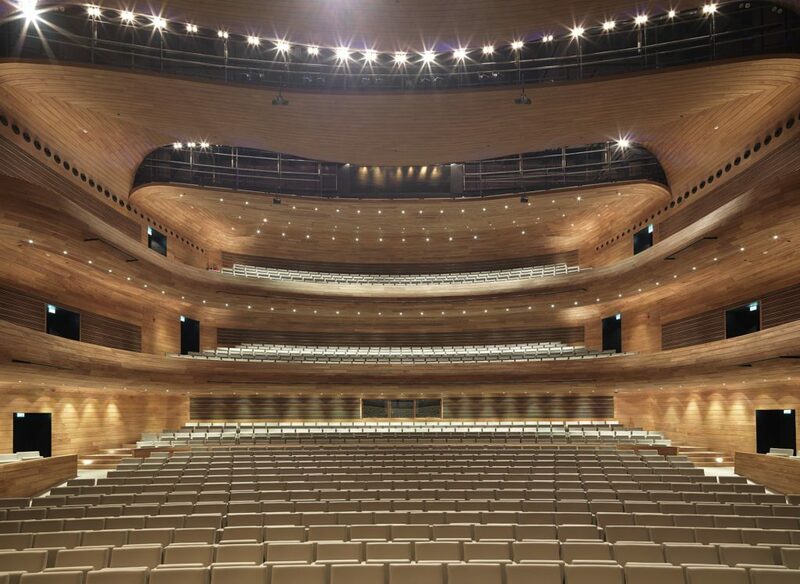 The design of this Italian style theater which spans 28 meters between the stage and the last row – was implemented by AS.ARCHITECTURE-STUDIO in partnership with London-based Theater Project Consultants, as well as that of Albert Xu, the famous acoustic engineer who has been involved in designing some of the greatest concert halls in the world. This project is representative of an emerging cultural life in the Middle East, such as for instance, the Theater festival organized by the GCC (Gulf Cooperation Council), which, brings together every two years the six Gulf countries (Saudi Arabia, Kuwait, Qatar, Oman, the UAE and Bahrain), and the Spring of Culture. It was launched by the historian and writer H.E. Shaikha Mai bint Mohammed Al Khalifa, who is committed to breathing new life into the Bahraini cultural scene. Her Excellency, Bahrain’s current Minister of Culture, is the first woman to be awarded France’s Prix Colbert in 2010 and also one of the most influential women in the Arab countries. She helps promote contemporary design and creation in her country, which also offers a wealth of historic heritage. Her list of achievements ranges from placing the Fort Qal’at Al-Bahrain on UNESCO’s World Heritage List, to the rehabilitation of the historic downtown Muharraq, the former capital of Bahrain. By investing and believing in the benefits of cultural exchanges, Bahrain is establishing itself as a forerunner in its openness to the rest of the world. An undertaking encouraged by H.E. Shaikha Mai, who is committed to strengthening ties between her country, those of the Gulf, and the remainder of the world. The National Theater of Bahrain, which she has supported for a number of years, will serve as a platform for this new vision. 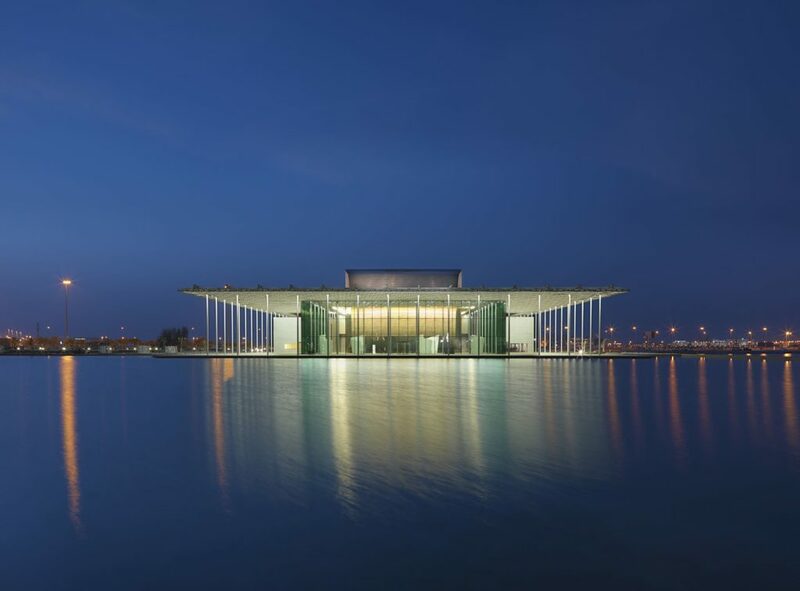 Bahrain’s National Theater forms, alongside with the Museum, a consistent architectural and landscaping entity, a true cultural center for the Kingdom. On either side of the lagoon, the museum’s white masses interact with the lightness of the Theater’s aluminum canopy, the latter reflecting itself in the water surface. The roof canopy shelters the hall of the Grand Foyer, which is entirely glazed, and its large entrance square, which seems to float on the lagoon water. The building is organized around the Grand Foyer, with a clear separation of public spaces, which include the main auditorium, the foyers, another modular auditorium, the ‘majlis’ (lounges for officials) and the café from the spaces exclusively reserved for artists, technical staff and administrative employees. The main entrance for the general public crosses the shaded esplanade, through the foyer-hall, which gives on to the lagoon, the museum, and further behind the Manama coastline. In the foyer, visitors discover the heart of the building: the 1,001-seat main auditorium is cladded in gold colored stainless steel. The entrances to the auditorium are located on the sides of this volume, where two staircases lead also to the upper foyers and lead also to the stalls and the two balconies. The main reception desk, the ticket booths and a small bookstore are all located in the main hall/foyer, which can also host temporary art installations. Located on either side of the foyer is the ‘majlis’ lounge for officials and the café, which gives on to the beautiful shaded terrace beneath the canopy. The stage doors and entrances for the theater staff are on the building’s east facade. Adjacent to this entrance, the artists’ foyer gives them access to their dressing rooms and to the backstage. Further, a staircase and an elevator leads to a one part of the first floor, which is occupied by the theater’s administrative services whilst the other part is dedicated to technical services. The entrance on the north side of the building is restricted to technical staff and deliveries. It also leads to the workshop, storage rooms and backstage. The auditorium’s design seeks to foster a link between the artists and the audience. The flowing curves of the balconies, the smooth and comfortable texture of the woodwork, which swathes the entire space creates the right conditions for the show. 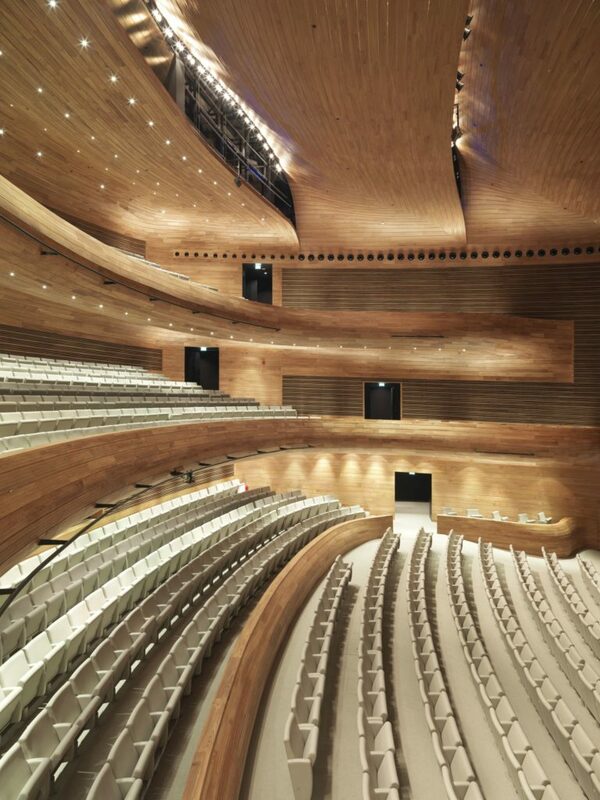 The main auditorium is designed like a musical instrument that resonates with a perfect tone. The materials have been specified to underline the National Theater’s architectural statement – its enhancement of the Bahraini landscape and its ambition to act as a focal point between land and sea. The roof canopy that covers the entire building is made up of woven perforated ribbons of anodized aluminum. The gaps they form insure proper ventilation and create a play on light, which transforms both the indoor and outdoor spaces, between land and sea, depending on the time of day. Beneath the shade of the canopy, the full height glazed wall of the main foyer-hall is of completely transparent thanks to its glass stiffeners. Rising above the roof canopy the outer shell of the main auditorium is covered with stainless steel with golden reflections. Its surface catches light under different angles: twinkling at dawn, flamboyant at sunset. Within the auditorium, the warm tones of the elm wood paneling are lit up by thin brass strips that underline the curved shapes of the balconies. A lower section of the building clad in granite, runs below the main auditorium and includes all the other rooms. Three major public venues are therefore highlighted both by day and at night: the esplanade beneath the canopy, the main Foyer-Hall and the main auditorium. At dusk, the canopy’s surface seems like a silver sea out of which emerges the gold-lit volume, as if the heart of the building was beating. In the night of Manama, between sky and sea, the theater becomes a shimmering vision, made of light and reflections. 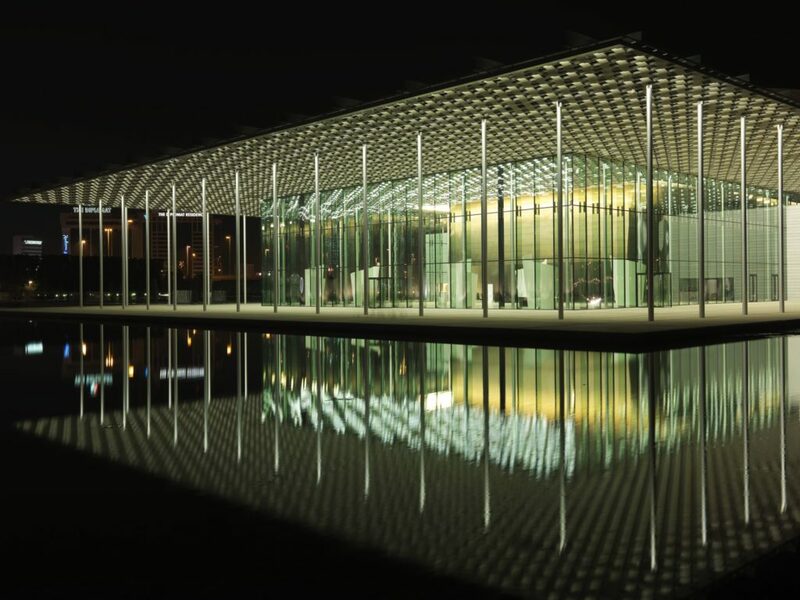 The scenography for Bahrain National Theater was developed in partnership with London based Theater Project Consultants, with whom AS.ARCHITECTURESTUDIO has worked in the past, on two Theaters built in Angers, France, and the Onassis Cultural centre in Athens, Greece. The chosen layout of the main auditorium was that of an Italian Theater with an orchestra pit and a retractable orchestra shell to allow the stage set to adapt to Theater, dance, opera or concerts. The acoustics are also modular and adaptable to these different types of performance. The stage floor is 30 meters wide and 18 meters deep. The stage height beneath the spot racks is 20 meters high with an extra volume below the stage floor. Three stage light racks beam down from above the stage ceiling. The orchestra pit is in the forefront, on the right of the retractable first five rows, to fit an orchestra of 60 musicians. The front stage is 19 meters wide and 9.5 meters high. Mobile panels form a diaphragm that can downsize the structure to 12 meters by 7 meters. Sound and lighting is controlled from the technical booth located at the back of the space at stall level, and is linked to the entire stagecraft equipment. 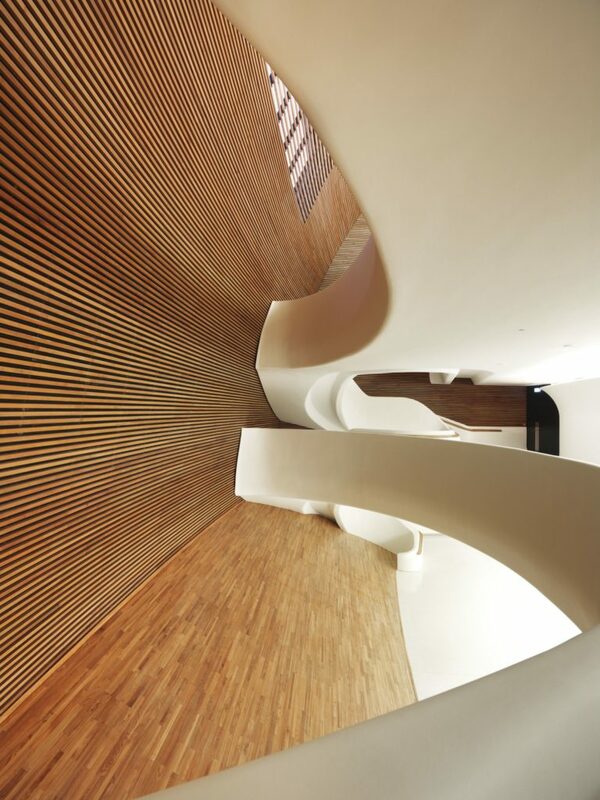 The auditorium’s acoustic was developed by acoustician Albert Xu, who had already worked in partnership with AS.ARCHITECTURE-STUDIO’s on the Onassis Cultural Center in Athens. The acoustics were studied for live shows with no sound system support. To ensure good quality acoustics for each type of disposition, sliding curtains located in the middle ground and made up of wood paneled shutters which can customize the quality of the auditorium’s acoustics to the room’s acoustic properties to each type of performance. The seating plan is organized into three sections: a 543 seat front orchestra section, a front balcony with 245 seats and a rear balcony with 213, totaling 1,001 seats. The central front orchestra section is split into two halves with, seats in the wings at the back and on the sides, to follow the balconies’ curves. The auditorium’s interior design creates a closer relationship between the audience and the stage. The design of the side lodges and seating plan in the wings creates a continuous flow, which plays down the distance to the back of the auditorium. A smaller adjustable auditorium can host smaller performances. 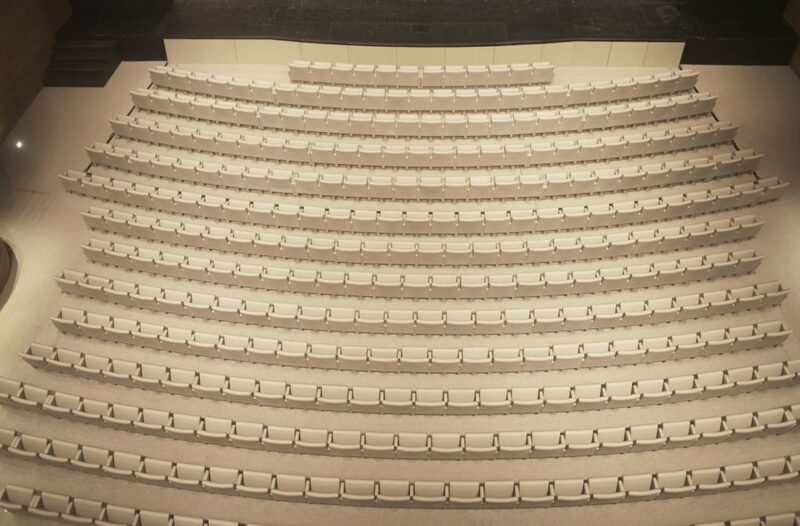 Its layout adapts to different seating plans: a front stage facing a floor of 144 seats; a circular seating plan surrounding the central modular stage or an open stage to do rehearsals. The room is equipped with a technical ceiling grid covering the entire surface as well as the control booth so as to host all types of performance. Behind the stage are four individual dressing-rooms, four shared dressing-rooms for four and two group dressing-rooms, offering performers and artists the best conditions to prepare.